Tommy and I are in the process of renovating our home office, and one of the first projects I tackled was designing some desk lamps to go on top of the new work station Tommy built. The Complete Guide to Imperfect Homemaking. 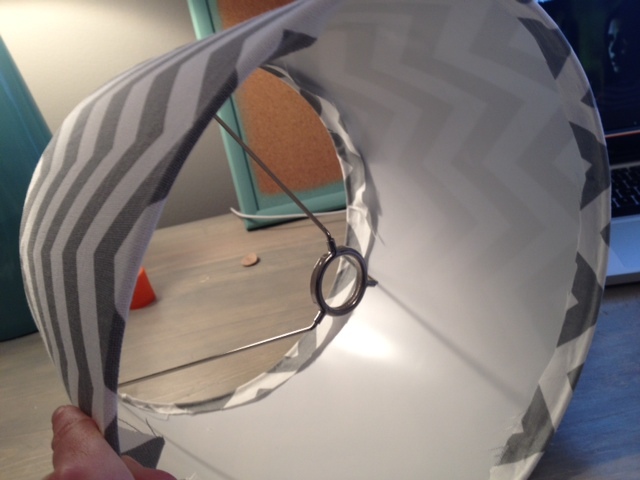 http://www.imperfecthomemaking.com/2011/05/how-to-recover-lamp-shade.html. 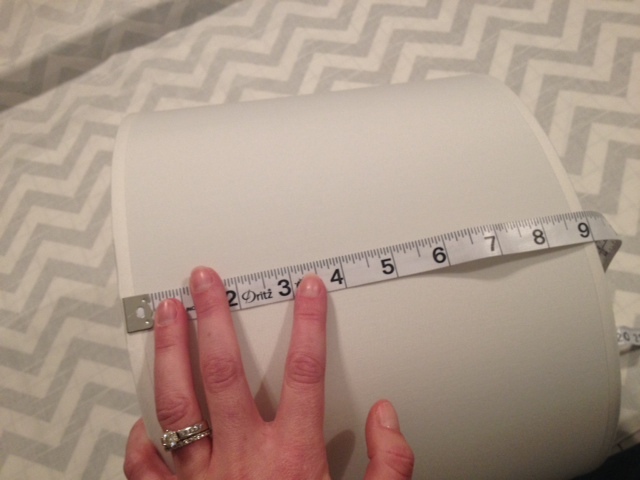 I began by measuring the height of my lampshade, which was nine inches. 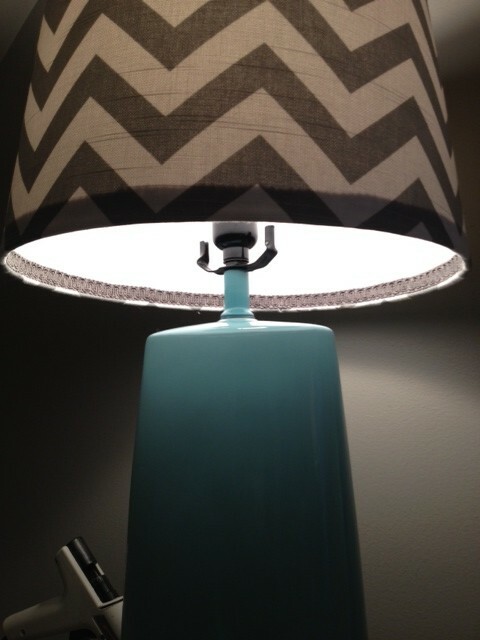 I added two additional inches to that so that I would have a one inch margin to wrap around the inside of the lamp. I did the same for the circumference, adding two inches to that figure also. 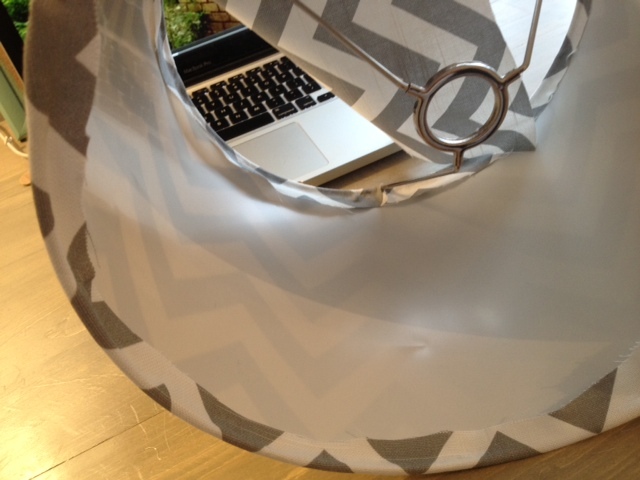 Place the lampshade on the fabric, seam side down. 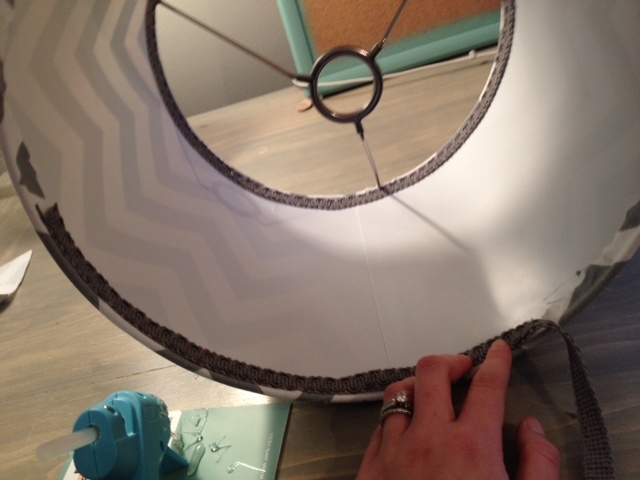 Roll the lampshade and trace the perimeter while you roll, until you get back to the seam being face down. Add your one inch “extra” fabric margin to either side of top and bottom perimeter, and your two inches to fold the fabric over and make a new seam. 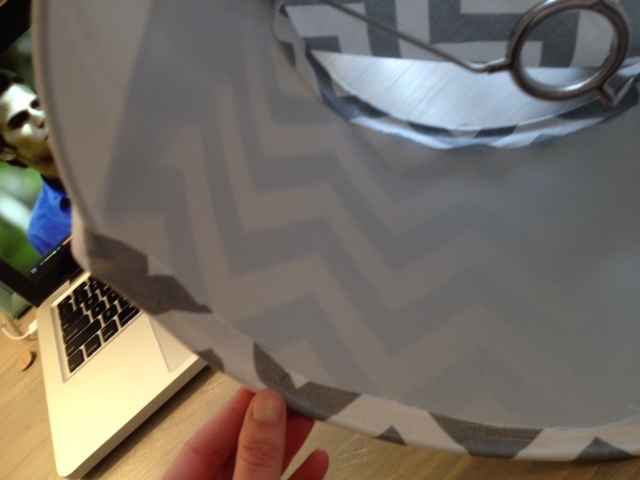 I worked with a Chevron fabric which – in hindsight – was not the easiest to wrap around my tapered shades evenly. I wish I had bought drum shades for this particular fabric. I bought standard shades, with a tapered flare. I attached one end of the fabric securely along the same using my glue gun. Then I worked in 3 or four inch sections, pulling the fabric tight as I went. Pulling the fabric tight is key. 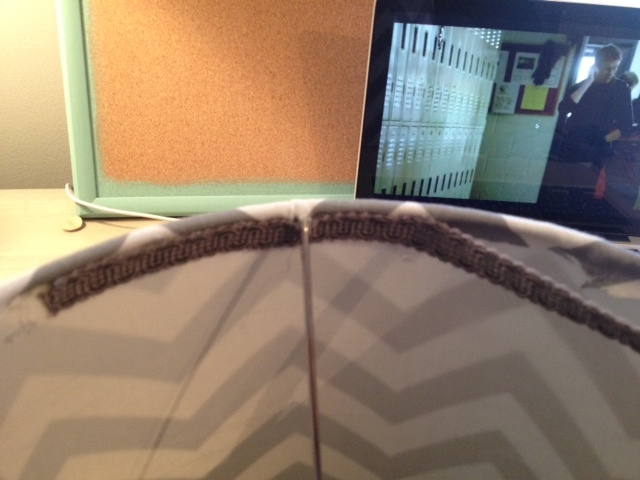 I worked top to bottom, back and forth to glue the fabric around the trim. That allowed me to manage any puckering that occurred because of the flared shape. 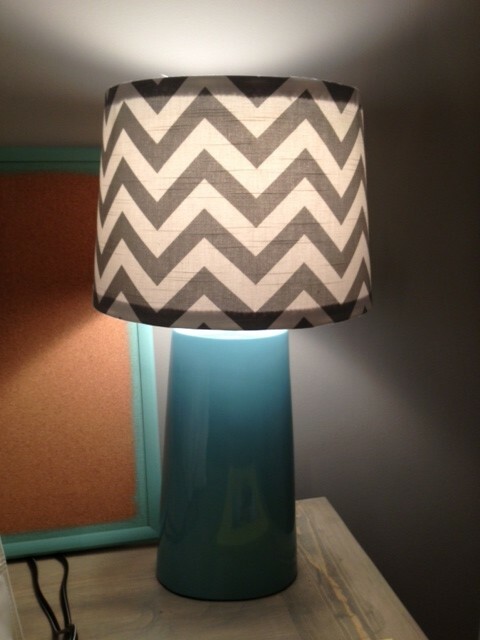 After I glued the fabric down evenly on the top and bottom, I folded over my two inch seam allowance and I glued it down along the back side of the lampshade. 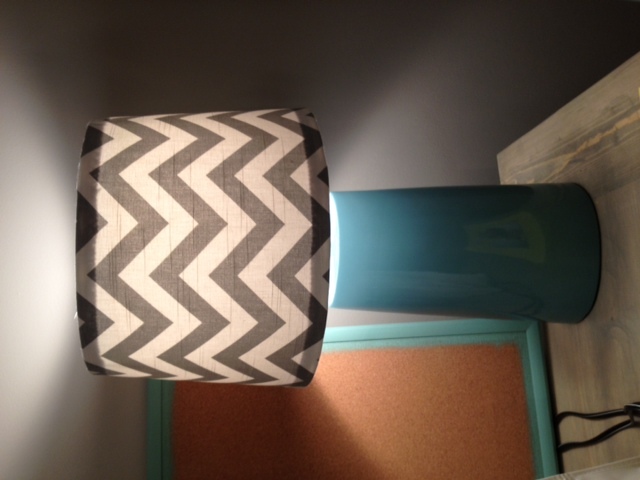 Next, I trimmed the excess fabric along the inside of the lampshade (where it wasn’t held down by hot glue). Confession: it looked like crap and left somewhat of a ragged edge. So I came up with a “bandaid” to cover that edge. 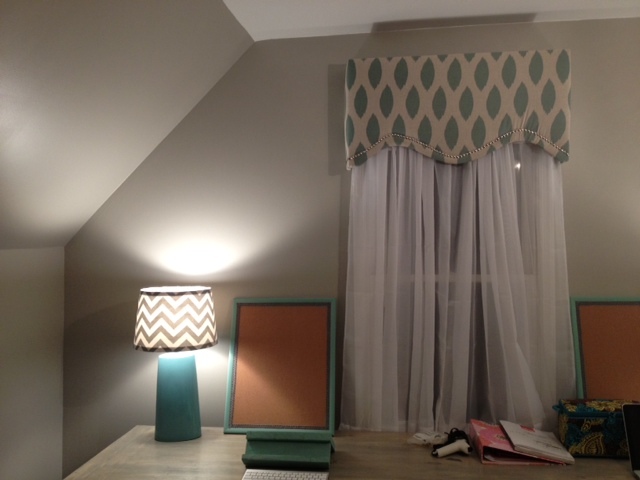 I used a simple straight trim – a gray trim that I bought at U-Fab for $2.99/yard – all the way around the inside perimeter of my lampshade on both the top and the bottom. And you just got a sneak peak of the office renovation (it’s in early progress). What do you think? 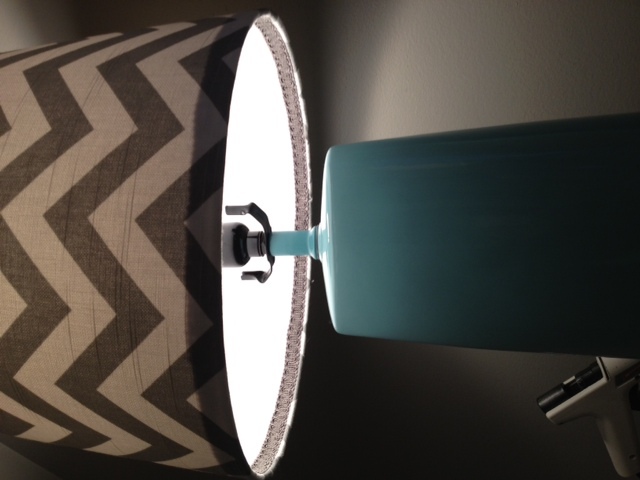 Do you have any tips or tricks for recovering a tapered lamp shade?